What is the OWASP Benchmark? The OWASP Benchmark for Security Automation (OWASP Benchmark) is a free and open test suite designed to evaluate the speed, coverage, and accuracy of automated software vulnerability detection tools and services (henceforth simply referred to as 'tools'). Without the ability to measure these tools, it is difficult to understand their strengths and weaknesses, and compare them to each other. Each version of the OWASP Benchmark contains thousands of test cases that are fully runnable and exploitable, each of which maps to the appropriate CWE number for that vulnerability. You can use the OWASP Benchmark with Static Application Security Testing (SAST) tools, Dynamic Application Security Testing (DAST) tools like OWASP ZAP and Interactive Application Security Testing (IAST) tools. The current version of the Benchmark is implemented in Java. Future versions may expand to include other languages. 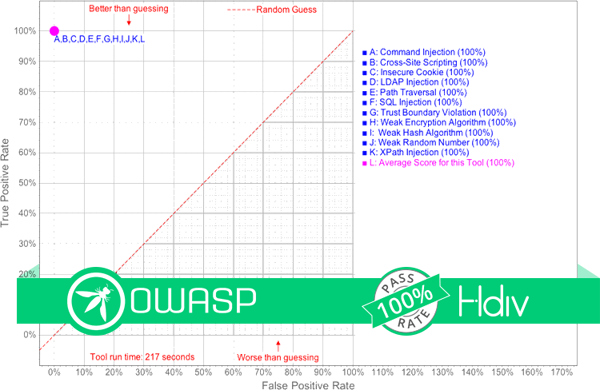 Hdiv Detection (IAST) scores 100% in OWASP Benchmark with 0 false positives.